Warewolf provides a robust framework for fine grain testing of your resources. To maximize the value of your work and the time taken to change and grow your services, you can add testing to each service, in a simple, fast Test Editor. 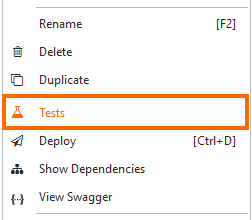 You can duplicate a test by pressing the Duplicate button after the Test Name. To execute and create tests, you will need View and Execute permission on the resource.